Complete brand positioning depends on its precision. At the branding agency, every word and the tone of formulation that brings together the content counts. This applies to the positioning of the company as a brand as well as to the positioning of individual brands, family brands, or umbrella brands. At the end, the brand positioning is the foundation for B2B branding. Brand positioning. The heart of branding. For us as a branding agency, coherent and comprehensive brand positioning is the solid foundation for the strategic development and management of a B2B brand. Working on brand positioning can be necessary at different points in time. There are various reasons for brand positioning. Its direction is oriented to the previous positioning space or to a new positioning space. 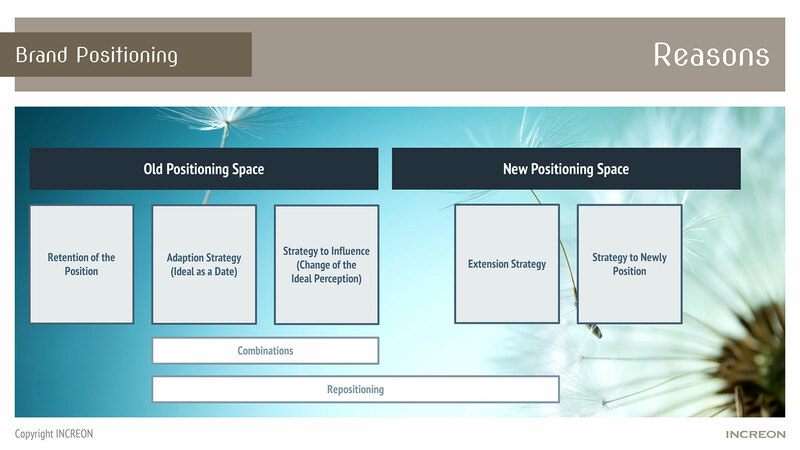 A typical reason for positioning is initial positioning during the launch of a new company or offering. The responsibility is high because changes that occur later have to be accomplished with greater effort. In ever narrowing markets that companies wish to serve with products or services that, at first glance, are more or less exchangeable, working out the positioning aspects requires a high degree of discipline and farsightedness for possible market developments, both on the part of the customer and of the branding agency. Communication and emotional uniqueness in brand development and brand communication can build on this. The long-term nature of brand management and development of the brand personality are ensured. The aim of a position update is to use over a prolonged time a position gained or to strategically expand this position. Last but not least, it should keep the competition at bay. Updating the positioning can also involve differentiating the product or service offered. In a horizontal direction, it is about developing an individual B2B brand into a family of B2B brands or a range of B2B brands. The vertical direction leads to diversification with sets or accessories. Repositioning makes a trusted product or valued service a new experience. A repositioning effort often involves strategic changes in some aspects. Or adjustments resulting from the changing spirit of the times or new market requirements. Repositioning is rarely connected with radical changes in the product. Strengthening one’s position as a basis for B2B brand management is about defending the position gained against competitors. The lively presentation of positioning aspects is intended to maintain the distance to competitors, while maintaining the brand’s position that will secure its success in the long term. This means that the B2B brand core remains unaffected; only the positioning aspects are constantly confirmed to the market and communicated in a diversified manner. At the outset, we concern ourselves with an important aspect before the four phases of positioning are examined in more detail. It concerns changing perspectives. Positioning is not only about how wonderful and unique one’s own company and own products are. It is primarily about what customers need. And even more: What customers want! This is what both B2B and B2C companies have to be measured against. With this change from “What we can do well” to “What customers want and we can do for them,” we at the branding agency develop the positioning. 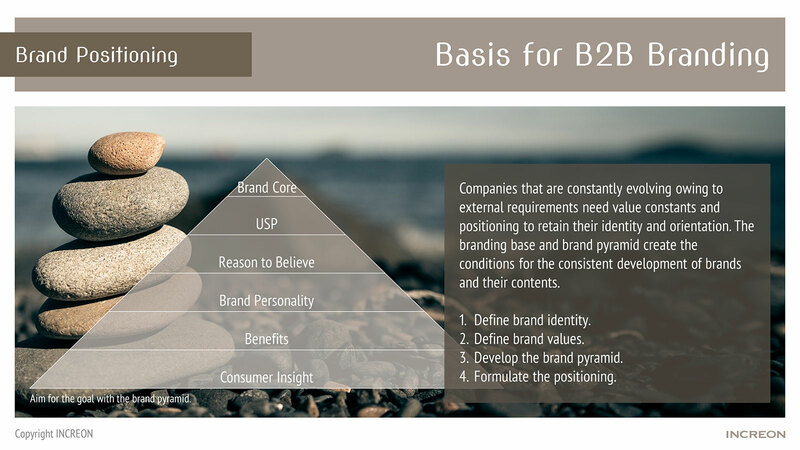 Successful B2B branding is based on a clear brand identity, brand values that are lived out, a compelling brand pyramid, and positioning formulated for the long term for the daily work with the brand. A claim, sometimes called brand promise, succinctly formulates factual aspects that are derived objectively from the offering (product, service). Advertising aspects are described to emphasize the emotional and thus more subjective experiences of a product or service. A brand promise may contain unique points and comparisons with competitors, because it is a paper purely for internal use. The brand positioning statement is not advertising copy! The reason why supports the claim (brand promise) using factual arguments. Materials, raw materials, and quality are input factors into the offering. Or processes, technologies, and know-how as process factors in the production of services. Effects, composition (what the product or service is made up of), and effects as a result and experience of using the product or service can also be used to justify the offering. Later, the arguments are reflected in advertising copy in various media. In industrial communication, B2B communication, and communication of products needing explanation, this is correspondingly detailed. The benefit serves to bring the effects of the offering to the attention mainly of customers and potential customers. At its core, the benefit can be derived from a few parameters. In B2B brand positioning, where quality and safety or security are at the heart of most of the issues, the focus of the benefit is on one of three things: the beneficial utility resulting from the suitability and quality of the product, on the expert utility based on being acquainted with or knowing about the product or service, or on value utility based on desired profiling and differentiation of the product or service. The benefit culminates in the proof. For proof, there are three basic approaches: system comparison in the sense of side-by-side or before-and-after, the endurance test for extreme requirements, and the example technique, which conveys security to the buyer and user through stories about benefits. This description and rationale of the performance of the company in a brand positioning statement is the basis for all brand, marketing, and communication work. We support this method as a B2B branding agency.